(Phys.org)—For the first time, researchers have demonstrated that shining a nanosecond pulsed laser at the base of a 100-µm-long diamond needle can significantly enhance electron emission from the tip of the needle. The ability to control electron emission with light in this way has potential applications in portable X-ray sources, electron microscopes, and sensors. The researchers, V. Porshyn et al., have published a paper on the electron-emitting diamond needles in a recent issue of Applied Physics Letters. "Our research shows how the energy and the charge transport work in a diamond needle in general," Porshyn told Phys.org. "Also, we show that a photostimulated diamond needle is capable of emitting picocoulomb electron bunches within nanoseconds. Thus, the observed current is enough to operate a compact portable X-ray source. In an ideal case, the device may be as small as a pen." The fact that diamond emits electrons at all is somewhat surprising, since bulk diamond is an electrical insulator. But the researchers found that, even when not exposed to illumination, the diamond needles exhibit a small electrical conductivity at room temperature. The researchers attributed this small conductivity to material defects. However, when the researchers illuminated the base of the diamond needles in vacuum with a nanosecond pulsed laser, the electron emission from the tip of the needles greatly increased. This observation suggests the involvement of a long-distance transport mechanism along the entire 100-µm length of the needle. The researchers propose that excitons, which are bound states of electrons and holes, provide the underlying mechanism. The excitons get excited by the laser's energy and propagate along the needle as a traveling wave packet. Some of these excitons are ionized by the electrical field, generating "hot electrons" that are emitted at the tip of the needle. The scientists expect that electron-emitting diamond needles may offer potential advantages for a variety of devices used in research. "You can, for example, very efficiently find out the nature of an unknown material with an X-ray source using a diamond needle by means of the X-ray fluorescence spectroscopy," Porshyn said. 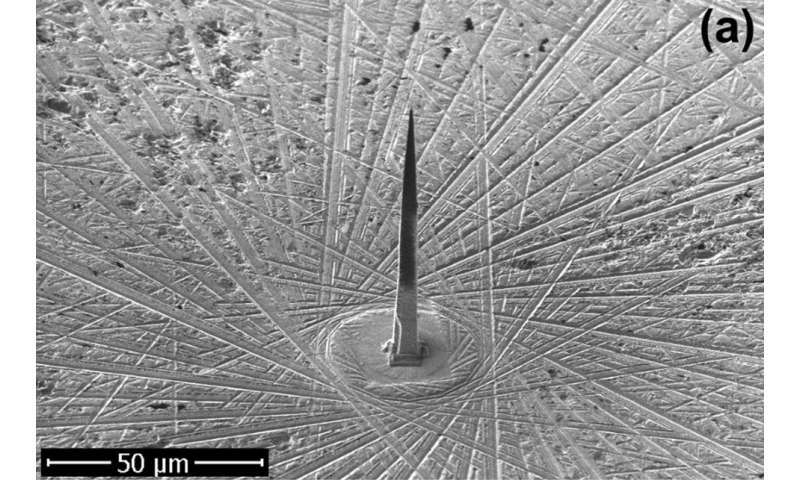 "If you put this needle as a cathode in an electron microscope, you can more easily reach a very high resolution (up to one nanometer) because you have a very efficient point field emitter. Of course, you can use the needle as sensor to detect light, as well." In the future, the researchers plan to investigate heating the diamond needles in order to improve the photoresponse, as well as to test the needles in a triode configuration, which is typically used in X-ray sources. We report an explicit experimental observation of photostimulated electron field emission from diamond. The electron emission properties of monocrystalline diamond needles were investigated in the dark and under illumination by nanosecond laser pulses. A prominent increase in the electron emission current was detected under illumination by light with photon energies above 5.0 eV. The linear dependence of the photoinduced emission current on the light intensity was observed in the spectral range of 5.0 to 5.9 eV, while its field dependence demonstrated saturation behavior. The remarkable feature of the observed phenomenon was the fact that illuminated and field emission areas of the diamond needles were spatially separated by about 100 μm in the used experimental setup. Possible mechanisms for the observed effects are discussed. SEMs are so cool, we have one in my lab. It even has an interlock chamber so you don't have to repump the vacuum every time you change the sample! It's definitely a very Star Trek feeling when you scan something and generate a false-color image where each color corresponds to a different element. Yeah, I had a project once (around 2004) where we did microrobotics/microgripper work (with haptic feedback and active force user assist - which was my part) in a SEM ('wet' conditions). Handling and feeling objects that are just a few micrometers long and a couple nanometers thick was a very surreal experience. Later built a demonstrator for a conference (where we couldn't lug an electron microscope to) with the same system where we had spectators direct the gripper to play 'Tower of Hanoi' on optic fibers as the 'towers' and 3D printed objects of 0.2, 0.4 and 0.8 millimeter diameter as the 'discs' under a microscope. Isn't this the principle behind atomic force scopes? @Ski, Atomic force scopes use the electron field surface of an atom at the tip of something similar, (but not producing the electron flow) is held very extremely close to being within 'contact' of the target and moved in a raster scan pattern to get an exact picture of the outer electron shells of the target sample and be able to show molecular and crystalline structure at a very fine resolution. The above critter actually produces a usable beam of electrons, suitable for extremely small x-ray production so that we may have x-ray testing equipment as cheap as today's laser pointers coupled to a specially outfitted smartphone. I can see the setup already, would not be hard to make and it would sell to engineers, boilerworkers and welders all over to be able to spot check their equipment and work work if they have doubts. Much better than the high radiation methods used now. "The fact that diamond emits electrons at all is somewhat surprising, since bulk diamond is an electrical insulator." That's not true. Diamond is conductor, not as good as graphite but yet - conductor. Could this be used to enhance my phonograph? yes, more deeper and fuller sound out put. Very interesting. I just wish I couldn't automatically see the weaponization potential for this discovery; suppose one had a hollow sphere around the same diameter of golf ball, the exterior surface of which was comprised of billions/trillions of these diamond needles, the interior surface of which exposed the needle bases and which was mounted on a small, battery-powered, ultra-high voltage, fast-dump circuit....pocket-sized Roentgen bomb that could be deployed without anyone knowing and with no symptoms evidencing until hours after the fact. everything is electric. try turning it completely off.